If I have a photograph of a ship that has made the news recently I will list it on this page. Please note that all photographs are copyright © www.ShipFoto.co.uk. If you wish to purchase these photographs for commercial purposes, please contact me. Copies of these images in printed or electronic format may be purchased from the ShipFoto Shop. The images must not be reproduced, either electronically or in printed format, or modified in any way without prior written permission from www.ShipFoto.co.uk. 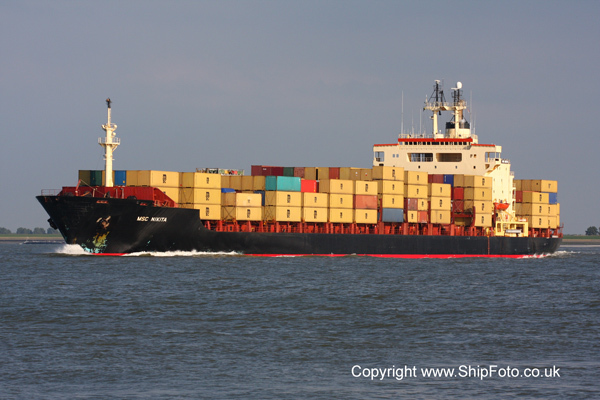 On 29th August off the coast of Holland the containership MSC Nikita was in collision with the general cargo ship Nirint Pride, which had just departed from Rotterdam, bound for Bilbao. The bow of the Nirint Pride was damaged, but the major damage was to the MSC Nikita, whose engine room flooded and was in danger of sinking. Her crew abandoned ship and were picked up by a lifeboat. the MSC Nikita was on a voyage from Gothenburg to Antwerp at the time of the incident. 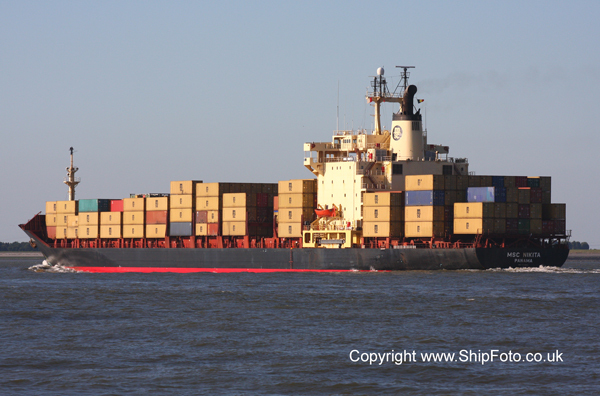 However, she did not sink and was towed into Mississippihaven, in Europoort, where her cargo of containers was unloaded. She has since been declared a total loss and after some temporary repairs at Rotterdam will probably be sold for breaking. MSC Nikita was built in 1980 in Nagasaki, Japan as the Sea-Land Independence. She became the MSC Nikita in 2007. She is of 32,629 gross tons and is Panama flagged. The MSC Nikita seen passing Walsoorden in the River Schelde on 14th June 2008. 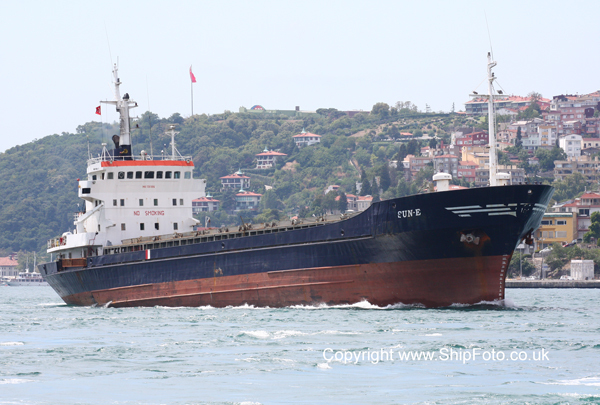 The general cargo ship Sun E sank on 21st August 2009, in the Black sea, 42 miles off the entrance to the Bosphorus. She had developed a list whilst on a voyage from Lesport to Diliskelesi with a cargo of scrap. The crew of 10 were safely rescued. The Sun E was built in 1974 at Husum, Germany as the Husum. Having had a string of names and owners, she became the Sun E in 2008 flying the flag of Moldova. She was of 1,888 gross tons. The general cargo ship Arctic Sea was reportedly hijacked on 23rd July off the islands of Oland and Gotland in Swedish waters. She was on a voyage from Pietarsaari, Finland to Algeria with a cargo of timber at the time of the incident. She then proceeded through the English Channel, and subsequently disappeared. She was eventually found on 17th August off Cape Verde, by the Russian warship Ladny. The eight "pirates" gave themselves up and the vessel was freed. The vessel was then towed to Novorossiysk in the Black Sea, by the Russian Navy for further investigation. Was the ship carrying a secret shipment of weapons or nuclear materials? Who were the hijackers? Agents of a foreign country? Why were the crew of the vessel detained after being freed from the pirates? Why tow the vessel all the way through the Mediterranean into the Black Sea when she was recovered? The Arctic Sea was built in 1991 as the Russian flagged Okhotskoe. 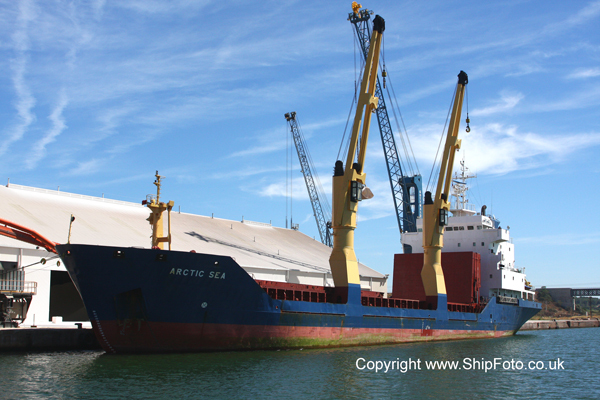 After a string of other names she was purchased by her current Maltese owners in 2005 and renamed Arctic Sea. 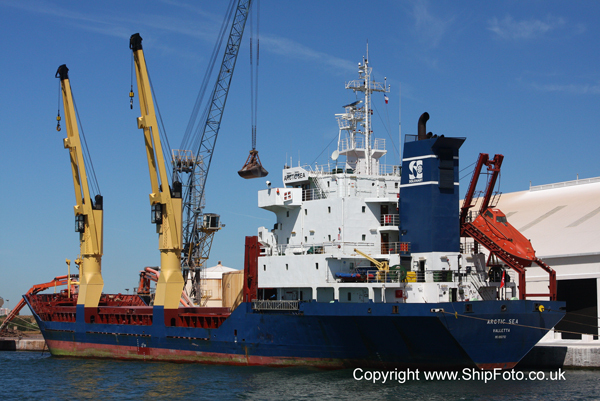 She is currently operated and managed by a Russian based company. The Arctic Sea seen at Fos, France, in happer times on 10th August 2008. 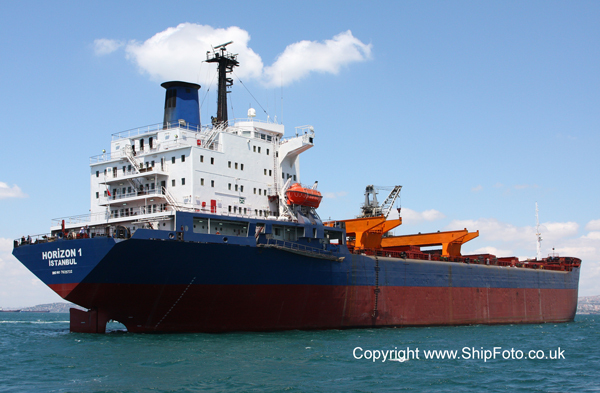 The Turkish flagged bulk carrier Horizon 1 was seized by pirates off Aden on 8th July 2009, whilst on a voyage from Saudi Arabia to Aqaba with a cargo of sulphide. Although in a area normally considered as safe and with a Turkish warship Gediz close by, the pirates succeeded in boarding and taking over the vessel. She is currently moored off Eyl, Somalia and as of 11th September remains under the control of the pirates. Pirates have demanded the sum of $20 million for the release of the vessel and negotiations are ongoing. The Horizon 1 was built in 1980 as the Bergo for Norwegian owners. she was purchased by her current Turkish owners in 2007.